Organizational Culture… What is ours? The Central Office administrative team and I had the opportunity to hear a few local leaders, including Richard Sheridan from Menlo Innovations, talk about organizational culture at a free event hosted by Ann Arbor SPARK. 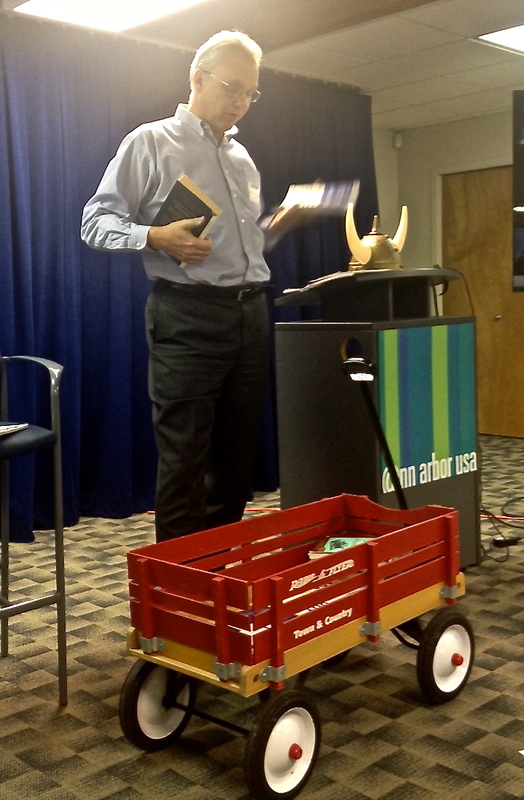 At the event, Rick told the group that it was important to talk explicitly about your organizations culture (and have artifacts, hence the red wagon & viking helmet above). Which begs the question for Saline Area Schools – what is our culture? In general, an organization’s culture is defined taken-for-granted values, expectations and collective memories that define the organization’s core identity. So – how would you describe the culture of Saline Area Schools? What do we value? What do we expect? What are the collective and shared memories that define our school district? ← Can access to digital tools actually improve student writing?